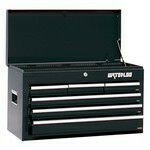 Description: Brand New, in box, Waterloo 26 , 6 Drawer, Locking Tool Box, Black, With Keys. This Box on Amazon is just under $300. This Box is the perfect size to keep all your tools in, keep it in the back of truck, or set on existing rolling box. This is a big box, not a handheld box.